This entry was posted on October 23, 2018 at 10:54 am and is filed under Biographical, The Universe and Stuff with tags COBE, Cosmology, DPhil, PhD, University of Sussex. You can follow any responses to this entry through the RSS 2.0 feed. You can leave a response, or trackback from your own site. Not only that Peter, but you have always been older than him! Eyes are a priority, indeed. We theoreticians (plus radioastronomers) don’t even have the excuse that we spent our best years peering through telescopes. I was living in Australia in 1987 and was able to see SN 1987A with my bare eyes. Peter: You should put a scanned pdf copy of your thesis on the web. Or if you have the source code (as it was in latex), put a modern pdf copy on the web. Whatever for? It’s an ancient relic! Were you required to produce and distribute a certain number of copies? Paper or microfilm? You could probably process the LaTeX code today and make a PDF. Why not? The Principia is online, so there is a precedent. 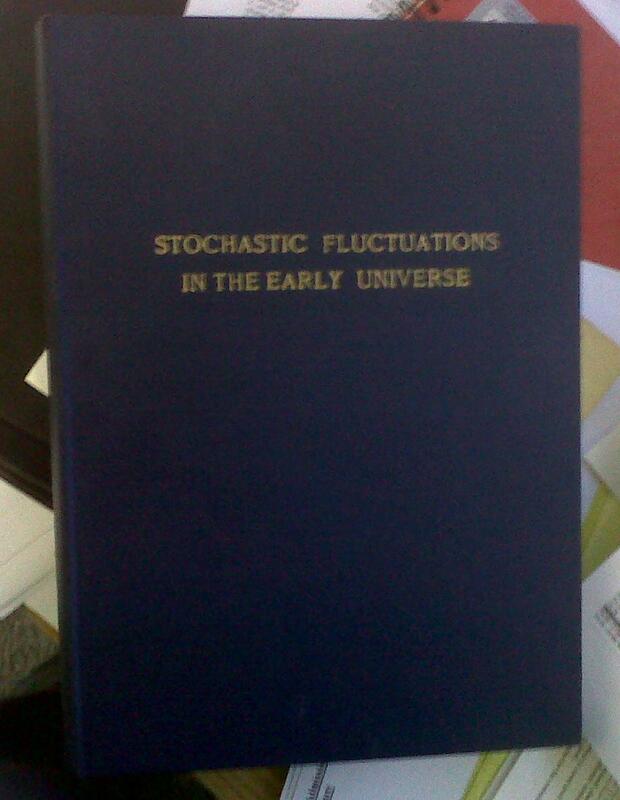 If I recall correctly, I had to make three (bound copies) one for the library and one for each of the examiners. I got one of them back – I have it now. I don’t have the LaTeX files. It’s not so easy to compile a pdf of theses so old as in those days we used to leave gaps for the figures and then paste them in later. Graphics figures could be printed out and cut to fit (or photocopied to fit) and images were photographed by mounting a camera in front of the image display screens and then developing the photographs and cutting them to fit! This means that we didn’t necesarily have the figures in the same directory and the LaTeX files, so any backup may not be complete (and any images may be lost as they were never files, thoguh I expect Peter would only have graphics files, if any). Of course it can be scanned if you find a volunteer to scan a few hundred pages. I don’t have any LaTeX or figure files of my PhD thesis (Manchester 1992), as of course they tend to be lost while finishing it quickly and rushing to a postdoc somewhere else (in the days before easy data storage). But I am thinking of scanning mine as there are only two copies in existence! I don’t have the LaTeX files and, as Simon pointed out, the diagrams were just pasted into gaps left with a \vspace as there was no way to embed figures in those days.